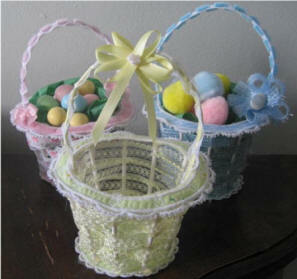 Five different mini baskets all done "in the hoop". Little or no sewing is required to complete these. An embroidery machine with 5x7 hoop is required. These could also be used as unique party favors. This "in the hoop" embroidery pattern makes a unique gift for that new baby in your life. Two different boxes for two different booties. Cuddle "fur" was used for the pink booties, white felt for the blue ones. The bootie measures approximately 4" from heel to toe which should fit a newborn to 3 month old. Although the boxes were designed to be used with the booties, they can also be used as a goodie box for special occasions. All designs and instructions are included to make two boxes and two booties. A 5x7 hoop is required. 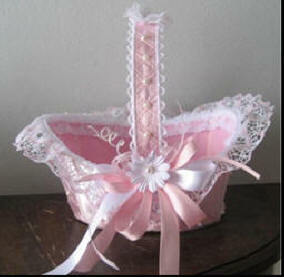 The boxes and booties can be decorated with all kinds of flowers, bows or doodads.